It is January and as my holiday dates blog has been popular and well received for the past two years, here are your all-important dates for 2016. Whether you are new to life in France, or just wanting to plan your holiday here in the quiet weeks outside of the French school holidays, I hope you find this useful. Please feel free to share amongst your friends and family. 27th March, Easter Sunday and this year, also the day the clocks spring forward an hour to Central European Summertime. With the exception of the holidays linked to Easter: Easter Monday, Ascension Day and Pentecost Monday, the above dates are the same every year and the holiday is always observed on the actual date rather than being moved to the nearest Monday as the UK would do. Public holidays can therefore fall on weekends and unfortunately for the working population in France, 2016 sees three holidays fall on a Sunday. To make up for this it is not uncommon for people to faire le pont (make a bridge) if a holiday falls on a Thursday (Ascension Day) or a Tuesday, by taking off the Friday or Monday giving themselves a four day weekend. This will be part of their annual holiday entitlement, so while most businesses will be open on bridge days, some staff shortages can be expected. It is worth noting that in many areas of rural France most shops, supermarkets, petrol stations, garden centres and DIY stores will be either closed or only open in the mornings on public holidays, although some opening hours is becoming more common. In France the schools are split into three zones (see more info here) and most of the holidays are staggered so not everyone is trying to hit the ski slopes or beaches at the same time, although be prepared for extra traffic on the roads on all Saturdays during the school holidays. The winter holiday is from 6th February to 6th March. Zone B gets the first two weeks, Zone A the middle two and Zone C the last two. The spring holiday is from 2nd April to 1st May. Zone B gets the first two weeks, A the middle two and C the last two. The summer holiday for all zones is from 6th July until 1st September. The October holiday for all zones is from 20th October to 2nd November. The Christmas holiday for all zones is from 17th December to 3rd January 2017. Whether your ideal holiday in France is an active one, a lazy one, a cultural one or a culinary one, I hope it is a good one. 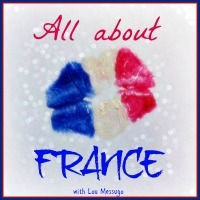 This blog has been linked to the All About France link up. Click here to read more about France from lots of great bloggers.